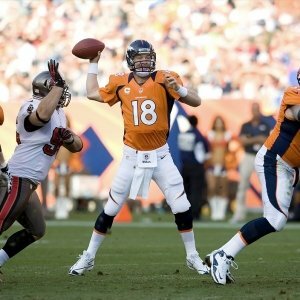 Denver has the longest winning streak in the NFL going at seven games. They have found ways to win every week, and they have beaten some decent teams along the way. The Raiders are not a decent team. They have lost five straight and are just a mess on both sides of the ball. Oakland should be a bit more motivated for this one than usual because this is a big rivalry game, but that won’t make the difference. The Broncos are well-positioned to come out on top in this one. The Niners lost a tough one to the Rams, but for some reason St. Louis is like kryptonite for the Niners. They are a much better team than they looked against St. Louis, and they should be able to show it at home against the Dolphins. Miami showed some real toughness against the Patriots, but ultimately they just weren’t talented enough. That should be even more of an issue here because the San Francisco defense is even tougher. If the Niners don’t win this one then it’s a sign of bigger troubles with the team. I’m very optimistic that they’ll be just fine. Seattle is playing tough, is currently in a wild card spot, and has the game to stay there. They are playing against Arizona. The Cardinals absolutely refuse to play offense. They played one of the worst games in NFL history against the Jets, and they lost it. They are just plain awful right now. If Seattle is the team that they want us to believe that they are then this is the kind of game they need to win easily. I don’t love Pete Carroll and don’t trust this team in the long run, but in this spot they are as good as gold. The myth of Andrew Luck just keeps growing and growing. He hadn’t played great for three quarters against the Lions last week, and it looked like his team was going down. But then he turned superhuman. He led two late touchdown drives to take the lead as the clock struck zero. It was impossible and highly impressive. He’s just that good. At this point it’s hard to not believe he is going to find a way to win against all but the very best opponents. Tennessee is just not a good opponent — especially on the road. The Colts won the earlier meeting in overtime, but they should win much easier this time around. As an aside, I honestly thought it might take until Luck’s third year for him to win his ninth career game, so I really can’t believe that I am picking them to do it in just his 13th game. What a draft choice that was. The Bucs lost a tough one last week, but they should bounce back strong. The Eagles will be frustrated that they blew a win last time, and they are lousy on the road. They also aren’t a particularly tough team right now, and they are up against a very tough squad. The Bucs still have some playoff hopes, but only if they win and win some more. That should be serious motivation here. It’s not often that a two-win team is worth a play in a survivor pool, but this could be the exception. They are at home against the Jets. New York is lousy on the road, they have been terrible offensively lately, and they will have the major distraction of a QB controversy looming over them. There is no city that handles a controversy worse than New York, and this team is far too fragile to handle it effectively. Jacksonville is playing better than their record recently, and the Jags are capable of picking up the pieces after the Jets implode.